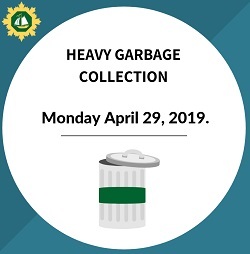 The items listed below WILL NOT BE COLLECTED during Heavy Garbage Collection. Items NOT ACCEPTED for Heavy Garbage will be left uncollected for the resident to remove from the curb. Residents who have household special waste material to dispose of, can drop these items off free of charge to CBRM's Household Special Waste Depot. CBRM's Household Special Waste Depot is located at 345 Gulf Crescent, Edwardsville. Please report to the Administrative Office upon arrival. Residents are encouraged to return the above items in their original containers with labels intact. Residents are encouraged to contact the Waste Management Hotline at (902) 567-1337 for disposal options for propane tanks and propane cylinders. Residents who have construction and demolition material to dispose of can bring these materials to the Waste Management Facility located on Spar Road in Sydney. Residents who have fluorescent lights to dispose of can drop these lights off free of charge to CBRM's Household Special Waste Depot located at 345 Gulf Crescent, Edwardsville. Residents who have asphalt shingles to dispose of can bring these items free of charge to CBRM's Waste Management Facility located on Spar Road in Sydney. Residents who have insulation to dispose of can bring this material free of charge to CBRM's Waste Management Facility located on Spar Road in Sydney. Residents who have gyprock to dispose of can bring this material free of charge to CBRM's Waste Management Facility located on Spar Road in Sydney. Residents who have concrete, mortar or bricks to dispose of are encouraged to bring these materials to the Waste Management Facility located on Spar Road in Sydney. Residents who have vehicle parts to dispose of are encouraged to contact the Waste Management Hotline at (902) 567-1337. On-road motor vehicle tires with a rim size of 24.5" or under have been banned from Nova Scotia landfills since 1996. Residents who have vehicle tires to dispose of can return up to four regulated used tires with a rim size of 24.5" or under at one time to any tire retailer in the province at no cost. Tires must be off the rims and free of mud and debris. All Passenger and Light Truck Tires including all on-road motor-cycle, camper and tow behind trailers. Medium Truck Tires including all commercial truck and tractor trailer tires not exceeding 24.5". Please contact the Waste Management Hotline at (902) 567-1337 for information on the proper disposal of other types of tires. Residents can also contact Divert NS at 1-877-313-7732 or online at Divert.ca. Residents who have leaf and yard waste to dispose of may place this material inside their green cart as long as the lid can close properly. Large amounts of leaf and yard waste that will not fit inside a green cart can be taken to one of CBRM's weekly leaf and yard drop off sites that open during the week of May 12, 2019. Leaf and yard waste can also be taken to the Waste Management Facility on Spar Road in Sydney year-round. Residents who have unwanted or left over paint, paint aerosols or empty paint containers/cans may return these products free of charge to any Enviro-Depot TM in CBRM. The paint container is in reasonable condition with the label visible and intact. The paint can is tightly sealed, lid is on and is contained in its original container. Paint is not mixed with other left over paints. Empty paint cans are now accepted for drop-off. Paint must be properly sealed in its original container with the label intact. Maximum Container Size is 25 Litres.